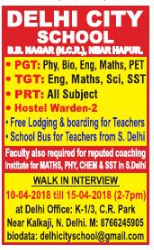 Delhi City School, Hapur has advertised in THE HINDUSTAN TIMES newspaper for the recruitment of PGT plus TGT plus PRT jobs vacancies. Interested and eligible job aspirants are requested to appear walk in from 10th to 15th April 2018 Check out further more details below. About School: B.B. Nagar block of Bulandshahr district of National Capitol Region (NCR) is known in India for its courage and bravery but lack in educational infrastructure. Student of this area are having finest brain but they lack in quality education. This book is not having any school which can fulfill CBSE norms (www.cbse.nic.in) under the guidance of Pro.Dr.Gautam Arya, PHD(Astro Phy) renowned educationist of this region, who taught in India and abroad for many years, wnats an educational institute where students can be admitted at very young age. So, school will get proper time to lay strong foundation of the student form the begining. School wants to train them for Sainik School, NDA, CDS, IIT-JEE, MEDICAL & CIVIL SERVICES (IAS & PCS) at the very young age. School wants to make them proficient not only in English Speaking but also confident in other languages of the world.